There are the first signs that Paytm is finally reining in the freebies that have made it one of India’s most popular startups. Paytm will no longer offer cashbacks to users — it will instead offer something called “loyalty points”. Each loyalty point will be equal to one rupee, and it can be used to make purchases across Paytm’s site and at physical merchants. But unlike cashbacks, loyalty points can not be transferred to other users, or moved to a bank account as real cash. It’s a restriction that’s unlikely to be popular with users. Paytm had made a reputation for itself having one of the most straightforward cashback programs in India — cashbacks received for purchases were immediately added to users’ wallets, and were as good as real cash. They could be withdrawn into a bank account, or sent to other users. But either of these actions moved the “cashback” away from Paytm’s ecosystem, thus negating its very purpose. Paytm’s cashbacks were meant to incentivize users to spend more money on Paytm, but users would often withdraw them immediately. In its growth phase, Paytm clearly didn’t mind this happening — growing its user base was clearly paramount. But with the platform having gained prominence over the last few years — Paytm now has over 250 million wallet accounts — it feels it can still retain its users while cutting down on benefits. And it has good reason to do so — these benefits have been costly. Paytm chose not to disclose its losses this year, but the company had lost Rs. 1,549 crore in FY 2016. This was mainly thanks to its cashbacks and generous discounts, which allowed the company to effectively provide cheaper prices than its competitors. Rival Mobikwik, though, isn’t surprised by Paytm’s move to rein in the cashbacks. “We Mobikwik predicted that cash backs have to give way to loyalty and thus Supercash was born. Great to see others now doing the same,” gloated MobiKwik CEO Bipin Preet Singh. We @MobiKwik predicted that cash backs have to give way to loyalty and thus Supercash was born. Great to see others now doing the same. Here’s to loyalty ! But Paytm loyalists will be wary of comparisons with MobiKwik. MobiKwik runs a loyalty program that’s, somewhat ironically, called “Supercash”. Supercash is inferior to cash in every way — it is received as a cashback, but only 10% of its balance can be used in a single transaction. That means even with Rs. 200 worth of Supercash in their wallets, users can only use Rs. 20 at a time. Further, Supercash can’t be used for recharges and bill payments. This had proven to be somewhat unpopular with users, who’d grown accustomed to Paytm’s straightforward cashbacks. Paytm hasn’t quite moved to a SuperCash model yet, but there are certainly signs it’s moving in that direction. People are already criticizing Paytm for its loyalty points move. 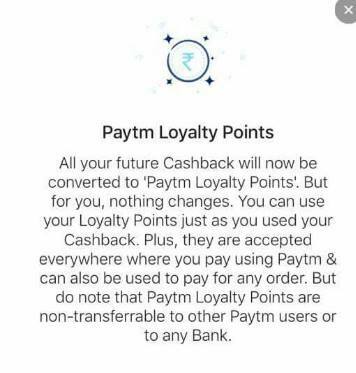 But Paytm’s decision to switch from cashbacks to loyalty points might come down to simple economics. If Paytm feels that the added transactions it gets from not letting cashbacks leave its ecosystem are worth more than the fewer transactions that might result from some annoyed users, it could make sense to institute such a policy. Paytm is already the most popular mobile wallet in the country, and as the market leader, has the heft to make changes that help it become more profitable. While it’s too early to tell how Paytm’s latest experiment will fare, it does indicate how startups are now thinking about user retention. With the most popular mobile wallet in the country now clearly prioritizing profitability over growth, the party of discounts, cashbacks, and offers that Indian consumer has been enjoying for the last few years might be drawing to a close. Update: Paytm Senior Vice President Deepak Abbot told OfficeChai that the decision was partly in response to RBI’s guidelines, which mandate that users with non-KYC compliant wallets will be unable to perform peer-to-peer transfers after 1st January — as such, they wouldn’t have been able to send send their Paytm cashbacks to other users anyway. However, even fully KYC compliant Paytm users will not receive cashbacks, but loyalty points henceforth.